A pristine white and gold themed wedding held at Jumeirah Creekside Hotel, Dubai has us currently swooning over its cute DIY details and the simplicity of it all. 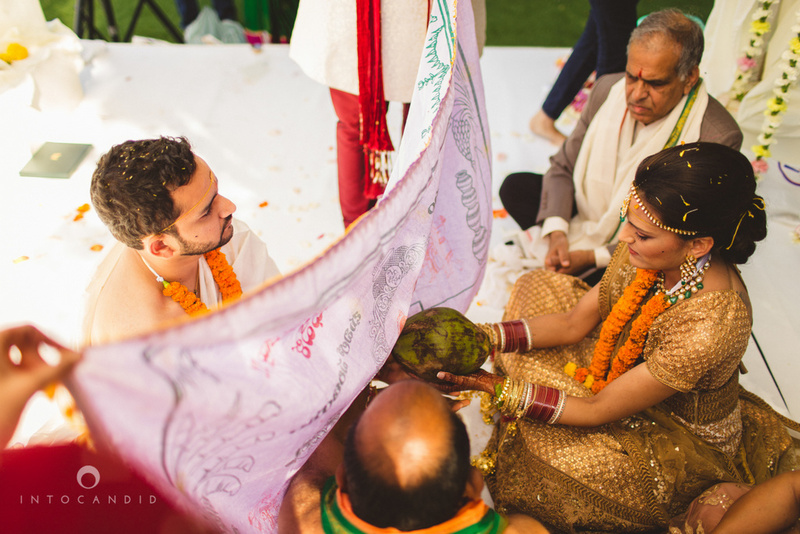 This international wedding feature is all about the love! 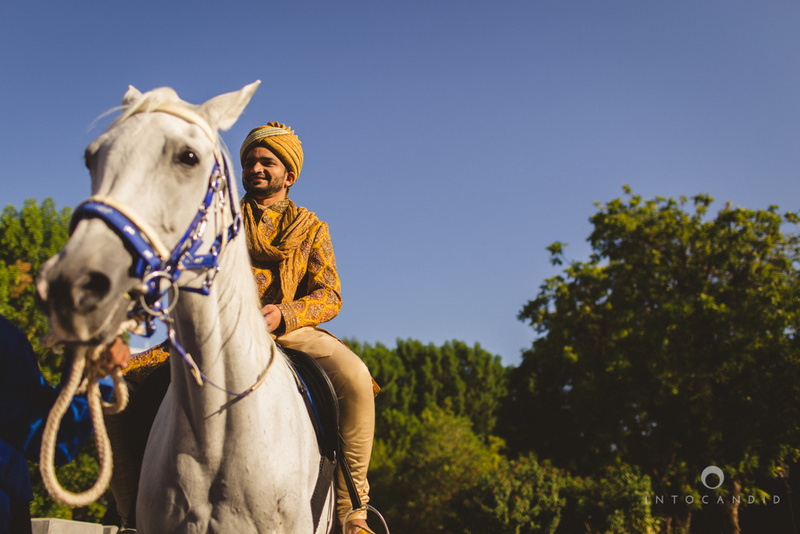 Tanvi and Satish’s entire day time wedding was set in a theme of white and gold. 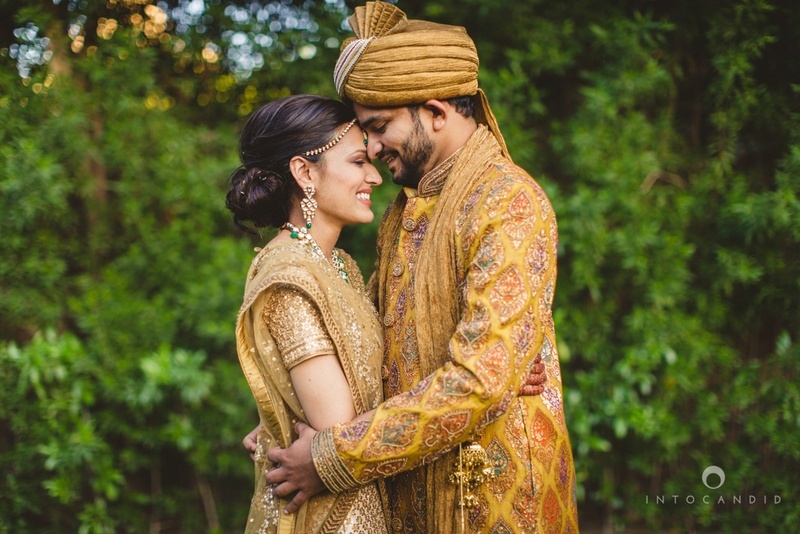 From this bride’s gorgeous gold bridal lehenga bought from Asiana Couture, Delhi to her dapper groom’s gold, multi-toned sherwani from Studio by Janak, and the outdoor wedding décor too. All of it perfectly matched their entire white and gold wedding vibe. Tanvi’s matching green and gold bridal jewellery from Suhana Arts and Jewels, Shahpur Jat, New Delhi was just plain stunning. Their wedding photographers Into Candid Weddings did a brilliant job in capturing this simplistic, sweet wedding affair with the utmost precision resulting in flawless wedding photographs! 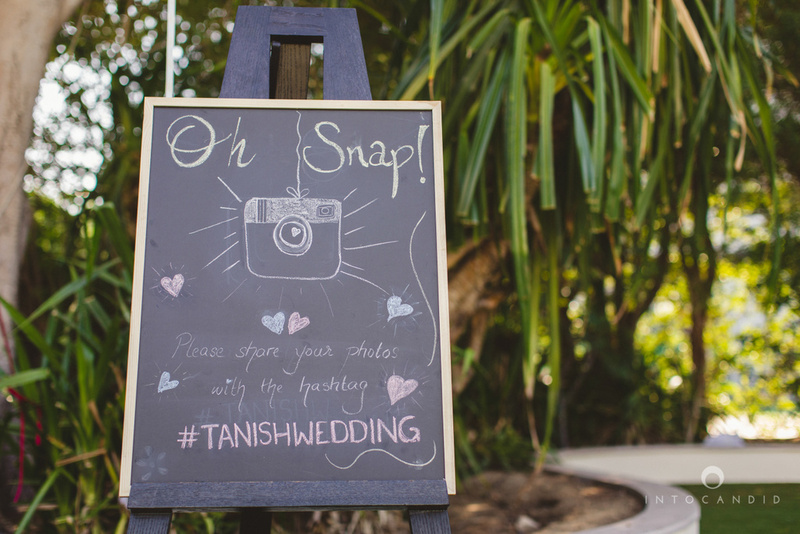 The cute details like the Instagram Chalkboard, the colourful pinwheels with ribbons that hung beautifully from a tree, and the little bells on their gorgeous white mandap made their outdoor wedding décor level up in the pretty factor majorly! The evening brought with it Tanvi and Satish’s wedding reception party held at The Address Downtown, Dubai and it was all things glorious. Regal table centerpieces, pretty pink and white fresh flowers placed with mirrored plates – absolutely stunning. So many #WeddingDécorGoals right here! Tanvi picked a royal shade of navy blue to wear at her indoor reception party. The gown from Studio by Janak flowed effortlessly as Satish danced with her. Their wedding cake too was oh-so-pinterest worthy – white, pearly and chic!